It is all based on first knowing what your average sale is. The average sale is the total amount you make over a period, divided by the number of orders. Let’s say you have a Shopify website to sell your work. In 3 months, you made 30 sales that brought in a total of $2300. Your average sale would be $76.67. It is important to decide what that time frame is and if the total number of orders are high enough to give you an accurate average. Websites like Shopify and Etsy have built in analytic tools that help you calculate or even show this average order value. If you use something like Google Analytics within your shopping cart, then there are reports there as well that can provide this information easily. Once you know this amount you are ready to make more in sales. Let’s look at how one artist that uses FinerWorks to drop ship her orders did it. Sarah has an Etsy shop that sells children’s artwork as prints on our archival matte paper. 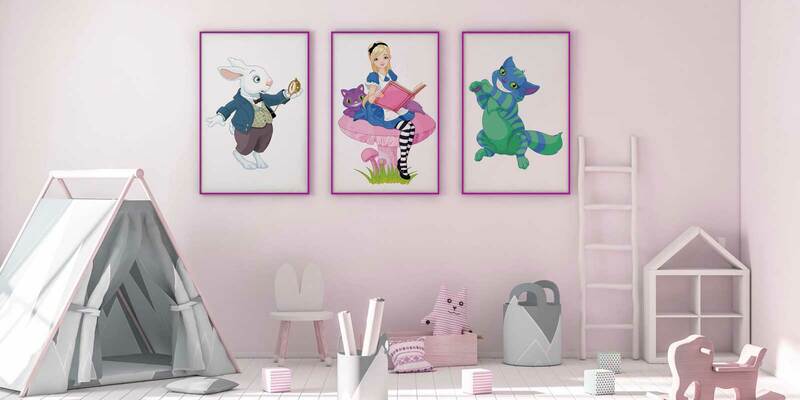 A lot of her customers are moms looking to decorate their child’s room or a nursery. I had the opportunity to speak with her after working with her on some technical questions she had with using our batch ordering tool for her drop ship orders. As I was on the phone with her I was looking at her Etsy shop and noticed that she had stated in her product descriptions that her paper prints were unframed. We already launched our Couleurs line of frames which include 20 different colors of a basic crown moulding. I suggested her artwork would look incredible in those frames and many of her buyers probably would love to be able to avoid having to fine a frame elsewhere themselves. She said that she would look into it. A few months later I noticed that many of her print orders were including those exact frames I suggested. I followed up with her by email asking how that was working out for her. She responded that she began to update her listings with the ability for people to choose to have the artwork framed with some of those options. She noticed a few things since she started to offer the frames: A good percentage of her orders were for the framed versions of her prints. Her overall order volume had actually gone up some. Those that did not want to pay the high cost of a framed print were still able to order the unframed version like before. And her repeat customers increased, being more noticeable with those ordering prints framed. She said that her profits were expected to be higher than the previously now that all her items were available with frames. One of the keys for Sara was to offer upgrades to her existing products without removing the existing options. If you were to do the same, these upgrades priced higher for buyers but won’t prevent those limited by budget from still ordering from you. The framing example is not the only way you can do this. It might be some larger sizes, or another format for the print. As some examples of adding more formats, one frequent user of FinerWorks recently began to offer wood print versions of her canvas prints which now make up a lot of her orders. Two others started offering a high-end product in the form of metal prints. They both used to do a lot of artboard mounted prints, but the metal prints now dominate appear to be a substantial number of there orders. Now that you can see how this can work, figure out what your average order is, try some of these methods or come up with a creative idea of your own. After a while check your average order value to see how it has increased. Even if it is only by a small percentage, it’s more then you would have made otherwise. As a new artist soon to enter into the world of starting up a business with my artwork this information is very helpful!